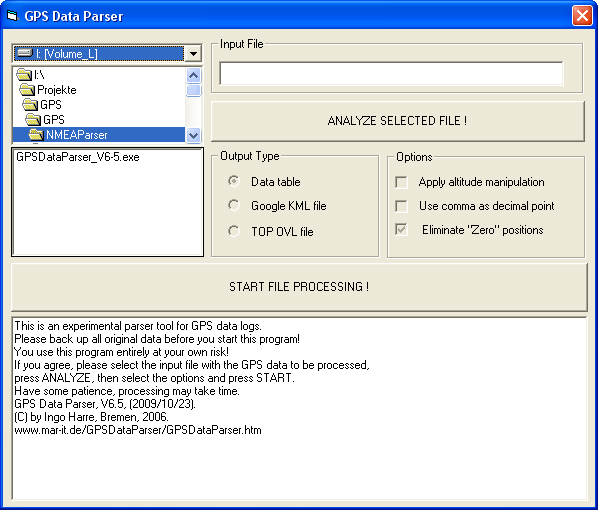 GPS Data Parser is a tool to convert files containing GPS position fixes into tables that can be used with spread sheets or mathematical programs, or into GOOGLE Earth® KML files for plotting the track onto GOOGLE Earth® images, or into OVL files to be used with topographical maps of German TOP type. calculate distances, speeds, plot altitude profiles using spreadsheet or other mathematical programs. Writes space-separated output tables containing time in seconds, latitude, longitude and altitude (if available), suitable for the use with spread sheet programs, such as MS Excel (view boat speed profile and flight altitude profiles in the examples page). Can produce GeoGrid® OVL files for track plot overlays on topographical maps, e.g. TOP 50 or TOP 200 (GeoGrid® is a product of EADS). I agree and want to download the GPS Data Parser program.